Samsung appears to be quite confident about their new Gear S3 smartwatch. According to a report from ETnews, sales targets for the upcoming Gear S3 smartwatch has now been increased to 5 million units per year, which is a 61.3% increase compared to current overall shipments of Samsung smartwatches and bands which was estimated at 3.1 million units by market research firm, IDC. The Samsung Gear S3, which was first announced at IFA 2016 is not only Samsung’s latest smartwatch, but is also the most advanced smartwatch they’ve made to date. The new smartwatch will come in two varieties, the Samsung Gear S3 Classic and the Samsung Gear S3 Frontier. They will both include a 1.3″ 360×360 Super AMOLED display with Corning Gorilla Glass SR+, Exynos7270 Dual Core 1GHz processor, 768MB memory, 4GB internal storage, and a 380mAh battery which is expected to last up to 4 days between charges. Running on Samsung’s Tizen OS, the new smartwatch will also support Samsung Pay, includes a multitude of sensors including GPS, altimeter and barometer, and is IP68 certified for water and dust resistance. Those who opt for the Gear S3 Classic will get Bluetooth/Wi-Fi support while those who opt for the more rugged Frontier edition will also get access to either LTE or Bluetooth. 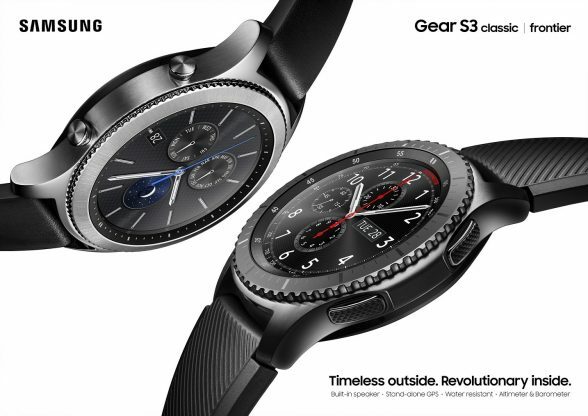 According to component suppliers, Samsung will receive shipments of components for Gear S3 mass production soon and the Gear S3 may go on sale as early as the end of October.